“The Power of Grassroots” is the focus of the Jan. 23-24, 2014 Wyoming Farm Bureau Young Farmer & Rancher (YF&R) Conference. Wyoming young farmers and ranchers are invited to attend the YF&R Conference at the Holiday Inn in Cody. The conference is open to all young agricultural producers between the ages of 18-35 (no membership necessary) and all Farm Bureau members. Children are welcome. Converse County rancher Rachel Grant discussed agriculture issues at a recent Wyoming Farm Bureau Young Farmer & Rancher Discussion Meet and earned $500 cash and a trip to San Antonio, Texas. Grant competed Nov. 16 with other young farmers and ranchers in the event held at the Wyoming Farm Bureau Annual Meeting in Laramie. Grant will represent the Wyoming Farm Bureau in the American Farm Bureau Federation Discussion Meet Jan. 11-12, 2014 in San Antonio, Texas. The winner at the national level receives the choice of a 2014 Chevrolet Silverado or a 2014 GMC Sierra pickup valued at $35,000 donated by GM. The three finalists receive a Case IH Farmall Tractor, $2,500 cash and $500 in STIHL merchandise from STIHL. Laramie— Policies dealing with livestock trespass, taxes, wildlife damages and support of the coal industry were among the many policies adopted at the 94th annual meeting of the Wyoming Farm Bureau Federation (WyFB). Held Nov. 14-16, 2013 in Laramie, Wyo., the meeting is an important step in the grassroots policy development process of Farm Bureau. Wyoming families facing hunger received a boost mid-November with the Wyoming Farm Bureau Federation Young Farmer & Rancher (YF&R) Committee “Harvest for All” project. The annual food and fund drive to benefit Feeding America food bank affiliates in Wyoming raised the equivalent of 5,672 meals for Wyoming families. LARAMIE—Frank and Leslie Eathorne, of Converse County, were awarded the 2013 Farm Bureau Distinguished Service Award at the 94th annual meeting of the Wyoming Farm Bureau Federation (WyFB). Presented Nov. 15, the award is given to those who have gone above and beyond in their service to agriculture. For annual meeting photos and information, visit our Facebook pages. 1) WyFB Facebook and 2) WyFB Young Farmers and Ranchers Facebook. Click on the links in the left column of this page. The pages are open so you do not need to have an account to view the photos. The 2013 WyFB Annual Meeting was Nov. 14-16, 2013. LARAMIE—Perry Livingston, of Sundance, was elected to his ninth term as President of the Wyoming Farm Bureau Federation (WyFB) at the organization’s 94th annual meeting in Laramie. Livingston and his family run a cow/calf operation in Crook and Weston Counties. Voting delegates elected Todd Fornstrom to his first term as WyFB Vice President. Todd and his family farm in Laramie County. He and his wife, Laura, have four children. Fornstrom has served in many different leadership positions within the organization; including Laramie County Farm Bureau President; a member of the Wyoming Farm Bureau Young Farmer & Rancher Committee; and state chair of the WyFB General Issues Committee. He is also a member of the American Farm Bureau Federation Sheep and Goat Advisory Board. The early-October blizzard, so powerful it has been named “Atlas,” was devastating to many ranch families in Western South Dakota. Tens of thousands of head of livestock were lost in the storm. Losing all or part of the herd that you — and your family for generations before you — has worked so hard to build up is a deep emotional blow. From an economic perspective, the ranchers will be facing a very difficult time in the weeks and months ahead as they decide how to regain their footing and rebuild. We at South Dakota Farm Bureau have established The “South Dakota Farm Bureau Cares” Fund to help ranchers impacted by the blizzard. 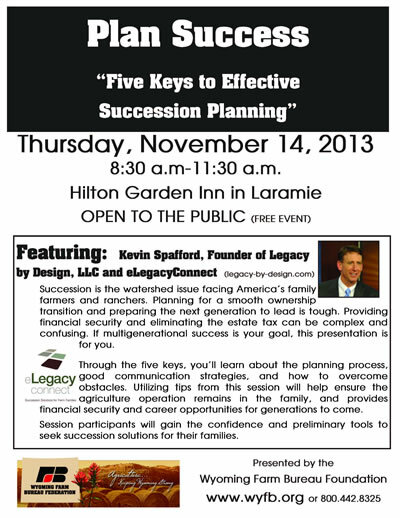 LARAMIE—The 94th annual meeting of the Wyoming Farm Bureau Federation (WyFB) will be held at the Hilton Garden Inn in Laramie Nov. 14-16, 2013; preceded by the WyFB Foundation Symposium. Featured speakers at the annual meeting include United States Representative Cynthia Lummis; United States Senator Mike Enzi; American Farm Bureau Federation (AFBF) Senior Counsel for Public Policy Danielle Quist; Paul Schlegel, AFBF Director, Environment and Energy Policy; and Kevin Spafford, Founder of Legacy by Design and eLegacy Connect. Full agenda attached.